This little Yagi has a high F/B. 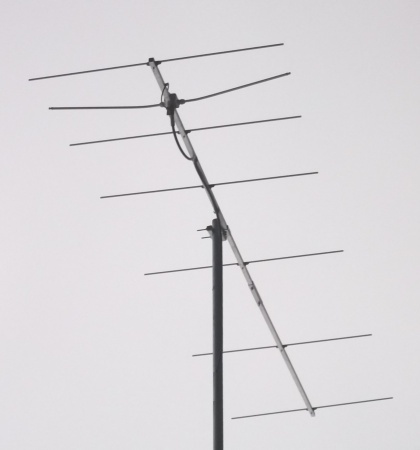 It may serve as a contest stack or small but effective EME 4-Yagi-Bay. The bent DE (K6STI style) transforms from approx. 17 ohms to 50 ohms at feed point for direct feed. element mounting methods or building styles. in terms of gain and antenna temperature - making a Yagi with very good G/T for a length < 1.5 wl. -3 dB H-plane         42.4 deg. -3 dB E-plane         49.8 deg. auto segmentation at 144.1 MHz and multiplying the resulting delta in freqency by * 5.85 mm/MHz. against the NEC model position for best SWR as seen in VNA plot. How many radio enthusiasts have looked up this website since Febr. 2016? -3 dB H-plane         19.0 deg. -3 dB E-plane         22.2 deg.